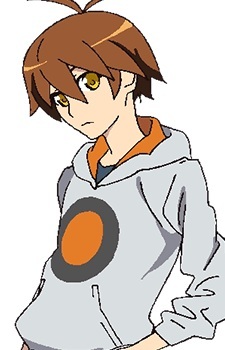 Boku "Master of Nonsense, Ii-chan, Defective Product, Nonsense User, Spooky E"
The narrator of the Zaregoto Series; people call him by all sorts of nicknames like "Ii-chan," "Ii-kun," and "Ii-tan," but his real name is never revealed. His birthday is in March, and his birthplace is Kobe. He consistently downplays his own abilities. He goes with the flow and gets carried along by other people, an attitude Maki Himena labels as "agreeing without harmonizing." He has a very bad memory, and often wishes he had at least an average one. He was quick to anger when young, though his time in Houston seems to have softened him somewhat. He and Tomo share a complex relationship. Both are independent and do not need other people. His feelings toward Tomo appear to be a mix of jealousy and affection. In the third volume, Kubitsuri High School, when asked what his name real name is, he offers the answer in the form of a quiz. Hints reveal that his name, if romanized, contains eight vowels and seven consonants and, if you are to use 1 for あ, 2 for い, 3 for う… and then 46 for ん in the Japanese Hiragana alphabet, the sum of his name is 134. The quizee determines the answer, but only comments it is a strange name. I responds he could have given a fake name and that he is proud that only three people have ever called him by his real name: his younger sister, Harukana Ii, Kunagisa Tomo and Omokage Magokoro. In the fourth volume, Psychological, it is revealed his nicknames are apparently derived from his alias, "Spooky E." The "Ii" comes from pronouncing "E."